Facebook Augmented Reality Ads: Transforming the Customer Experience - Upcoming Media Inc.
Once again, tech giant Facebook is adding a new game-changing innovation to its arsenal with Facebook Augmented Reality Ads. Currently being tested on the Facebook app, this new feature will allow advertisers to offer exciting augmented reality (AR) experiences right in their newsfeed. Facebook users will have the ability to try on fashion accessories, experiment with cosmetics, and see how furniture looks in their home, all with one simple app. 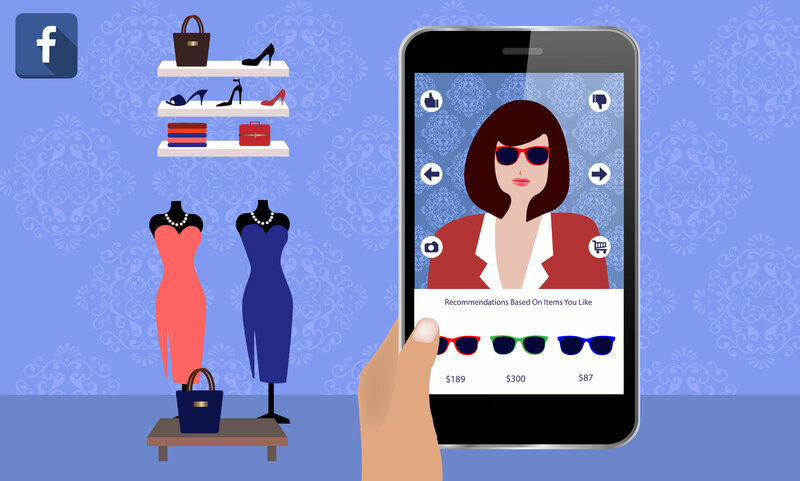 With Facebook AR ads, brands can transform the entire customer experience into something truly unique in the world of digital shopping. AR ads consolidate everything that consumers have come to love about online shopping, and elevate the experience to go beyond product discovery into product engagement and then to the shopping cart. The reach is incredible too – nearly 1 billion people use Facebook, so brands have a ready audience of people already comfortable with online engagement. At an event in New York City on July 10th, Facebook announced that AR ads are expected to launch in the U.S. before going international. But that won’t stop brands like Michael Kors from being the first to get on board. 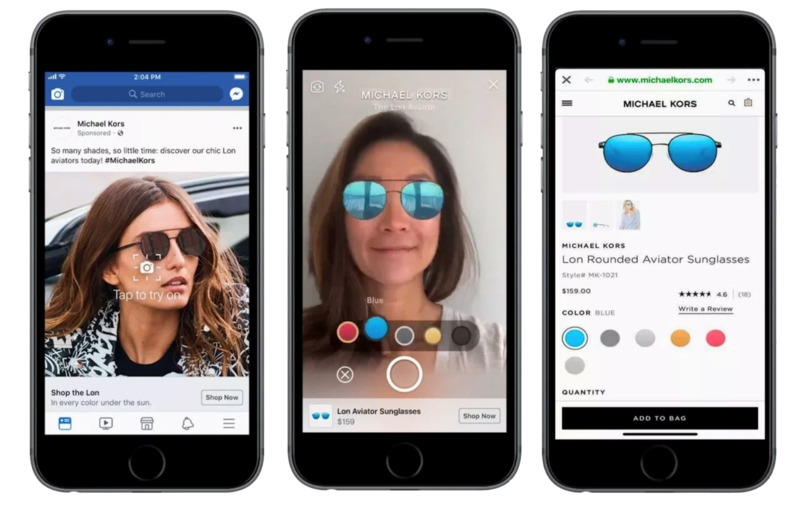 Michael Kors, famous for their line of luxury handbags, shoes, watches, and more, will be using Facebook AR ads to market their line of designer sunglasses. The company will be creating a completely immersive experience in which users can browse through their selection of sunglasses and click the “Tap to try it on” button when they see a pair they like. The app will then access the mobile camera to place the sunglasses on the user’s face. Shoppers can “put on” as many pairs of sunglasses as they wish, and then order products right through the ad. No linking to websites or payment interfaces needed – the entire shopping experience happens right within the ad. It’s the next best thing to being in a store, and saves the time one would spend traveling to the mall, parking, and working their way through crowds. In that regard, for many people AR ads will be completely preferable to physical shopping, and can be done anywhere, anytime, 24 hours per day. Michael Kors is currently brand testing Facebook AR Ads, and one can be confident that more brands will come on board once the technology goes live. The good news for Michael Kors is that it will already be in front of Facebook users, leaving their competition scrambling to get up to speed. Facebook’s AR ads innovation is just the latest example of the tech company’s willingness to embrace technology that helps brands further engage with their customers. Instagram Stories also offers a shopping function. When Instagram users tap on the sticker with a shopping bag icon in their Stories feed, they are provided more details about the product. Facebook recently announced that this innovation is expanding globally, and expected to reach 400 million daily users. With 80% of Instagram users following a business, the shopping functionality is another marketing tool worth considering. Between shopping on Instagram Stories and the upcoming Facebook AR Ads, brands now have additional digital streams to attract new customers and further develop relationships with repeat buyers.